Vehicular parking facilities play an important role in the efficiency of Chester County's overall transportation system. Parking availability can affect not only the destination, but also the means people will use to reach a destination. The more difficult it is to find available parking, the less likely people will drive their automobiles to a destination. Lack of available parking also makes it more likely that people will utilize public transit, if it is available and relatively convenient. If there is a consistent abundance of available parking, it may indicate the parking lot is too large creating unnecessary environmental impacts such as increased stormwater runoff and heat island effect. Determining the proper size, location, and layout of parking facilities are important decisions that municipalities must make to provide the most appropriate level of parking within a community. Facility types generally include off-street surface parking, on-street parking, and structured parking (parking garages). This tool focuses on the physical design attributes and improvements that municipalities should consider in the development of parking facilities. The 'Parking Facilities: Policy' tool focuses on how a municipality may use and/or regulate parking facilities through various parking management planning options to achieve a functionally and environmentally appropriate amount of parking spaces, as well as the use and potential development of park and ride facilities to mitigate traffic congestion. Safety: Safer pedestrian conditions can be encouraged by minimizing vehicular conflicts and providing adequate lighting. Energy Efficiency: The provision of properly-designed and adequate parking facilities can encourage more public transit use, and reduce the heat island effect that can lower cooling costs for adjacent structures. Environmental Quality: Properly-designed parking facilities can improve water quality by filtering and cooling stormwater runoff through stormwater best management practices, including vegetated swales and rain gardens. Aesthetics: Good parking design can mitigate the visual impacts of surface parking lots with landscape material and/or visual buffers. Pedestrian/Vehicle Conflicts: Unsafe conditions for pedestrians can be created by unnecessary vehicular conflict points and lack of sufficient lighting. Increased Heat: Heat can be reflected by exposed asphalt or concrete surfaces not shaded by landscape material. Increased Runoff: Stormwater runoff that may be heated by contact with pavement, and unfiltered water volume can harm natural drainage patterns and ecosystems. Poor Aesthetics: Unwelcome visual conditions can be created by open expanses of paving with a lack of proper landscaping and/or buffering. Parking facility design must reflect many factors including the amount of space available for the facility, the number of parking spaces required by the destination's land use, environmental and site specific conditions. The following provides general design principles and guidance regarding the physical elements to be addressed when developing parking facilities. Utilize rectangular parking area configurations to minimize land area requirements. Dead end parking areas should be avoided whenever possible. The illustration above shows a simple angled parking layout. Off-street parking is the most common type of parking facility. These facilities have traditionally been developed as one large parking area resulting in expanses of asphalt with little consideration for the negative visual impacts or stormwater implications. Parking lot designers should limit the places where pedestrians are forced to cross vehicular traffic, and reduce redundant driveways, inefficient single stacked parking bays, locations where cars need to back into intersections, limit vehicular stops and turning movements, as well as consider appropriate locations for trash enclosure pads with regard for trash vehicle turning radii. This is the most efficient and economical parking configuration because it accommodates the most vehicles per square foot of available parking area. Perpendicular configurations work best with two-directional driveway aisles; one way drive aisle configurations have almost the same space requirements and offer little advantage in circulation. Standard dimensions for this configuration are 9 foot wide by 18 foot deep spaces with a 24 foot wide (two-directional) driveway aisle for a total 60 foot wide cross section. The primary advantage with any angled parking is the ability to provide more spaces or better circulation patterns when the space available for parking is dimensionally constrained. The 60 degree angled parking configuration is ideal for a fast turnover rate or predominantly short term use and may be preferred over 90 degree parking in some situations due to ease of navigation, even though it may be a less efficient use of the available space. Standard dimensions for this configuration are 9 foot wide by 20 foot deep spaces with a 24 foot wide (two-directional) driveway aisle for a total 64 foot wide cross section, or 16 foot wide (one-directional) driveway aisle for a total 56 foot wide cross section. The 45 degree angled parking configuration displays similar benefits and limitations as the 60 degree configuration. Standard dimensions for this configuration are 9 foot wide by 19 foot deep spaces with a 14 foot wide (one-directional) driveway aisle for a total 52 foot wide cross section. 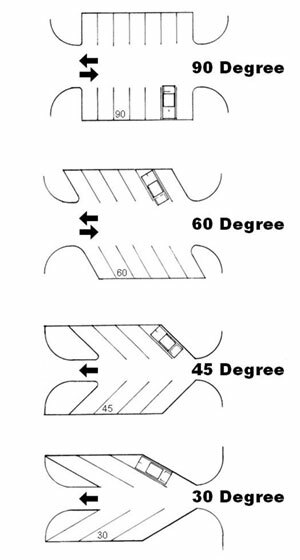 Two-directional driveway aisle dimensions are not provided since two-directional 45 degree parking requires almost the same amount of cross section width as 90 degree configurations while providing significantly fewer spaces. Similar to 45 degree configurations, this configuration progressively increases the amount of pavement required per space while narrowing the double bay cross section. Standard dimensions for this configuration are 9 foot wide by 16.5 foot deep spaces with a 12 foot wide (one-directional) driveway aisle for a total 45 foot wide cross section. Parking areas are not conducive to healthy plant growth due to reflected sunlight, heat gain, and exhaust fumes. Only plant species that are tolerant of these extreme conditions should be used. Non-porous pavement limits the oxygen and water exchange between plant roots and the atmosphere. Soil compaction resulting from construction amplifies these conditions for existing trees. Consider the use of porous pavements and existing tree protections during construction of these facilities to promote plant health. Curbing should be used for planted islands where appropriate to protect against trunk damage created by vehicles. In addition to providing curbing and/or bumper blocks, ensure that parking spaces provide sufficient separation from trees and shrubs to avoid damage. Native plant species should be selected whenever possible. trees susceptible to insects and diseases. are resistant to insects and diseases. Lighting is an important component of parking lot safety, especially for a facility that has early morning, late afternoon, or night time use. The Illuminating Engineering Society (IES) recommended minimum average illumination level for a surface parking lot is 0.5 footcandles. The IES also recommends that all pedestrian routes and entrances/exits should be well lit with a minimum average of 1.0 footcandles. Lighting poles are typically 20-25 feet in height, and should be located in islands or in parking perimeters and protected from potential vehicular damage. Lights should be pointed downward to minimize light pollution and excess glare. Cutoff fixtures should be used to avoid light spilling onto neighboring properties. Bulb selection will affect the color of light projected. High pressure sodium bulbs are relatively inexpensive, yet cast an orange hue while more expensive metal halide bulbs cast more of a white light. LED fixtures are now becoming more widely used as the technology for these fixtures has advanced to provide much brighter fixtures. The energy required to power LED fixtures is considerably less than standard bulbs resulting in significant cost savings. Accessible parking spaces serving a specific facility should be located closest to an accessible entrance. If facilities have multiple accessible entrances, accessible parking spaces should be dispersed and located closest to the accessible entrances. Accessible parking spaces should be at least 8 feet (96 inches) wide. Parking access aisles should be part of an accessible route to the facility entrance. Two accessible parking spaces may share a common access aisle at least 5 feet wide, with the potential for the aisle to be 8 feet minimum width if shared with accessible van parking. Parked vehicle overhangs should not reduce the clear width of an accessible route. Parking spaces and access aisles should be level with surface slopes not exceeding 1:50 or 2% in all directions. Surface parking lots have traditionally been developed with large expanses of asphalt resulting in a significant increase in stormwater runoff. The stormwater was then collected by a drainage system where runoff from large storm events would be temporarily stored in a retention basin then slowly released through control structures into the natural drainage systems. This general concept has been revised and reflected in Pennsylvania through the State's adopted erosion and sediment control regulations where the focus is to infiltrate or recharge a much larger portion of this runoff into the ground. As part of this shift, the National Pollutant Discharge Elimination System (NPDES)â€”as authorized by the federal Clean Water Actâ€”now requires a permit for any earth disturbance exceeding 1 acre, where the threshold was previously 5 acres. These permit applications are reviewed by the local Conservation District as part of the land development process. These new regulations create unique opportunities to incorporate many of these BMPs into the design of surface parking. Please refer to the 'Examples' section of this tool to see how BMPs have been incorporated into some recent parking lot developments in Pennsylvania. On-street parking is most commonly associated with urban or village landscapes and is often metered as a revenue generator as part of a community's parking management program. On-street parking spaces are typically included in the design of the roadway within which they are located and also referred to as 'parallel' parking. 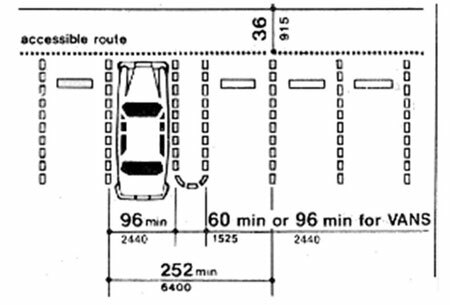 Standard dimensions for on-street parallel parking spaces are 8 feet wide by 22 feet long and placed at least 50 feet from any intersection. On-street angled parking is less common and often associated with historic or central business districts with lesser traffic volumes where it also serves as a traffic calming effect. These installations require much more space within the road right-of-way than parallel parking but offer the opportunity to create more stalls within the same length. Back-in angled on-street parking has recently been installed in the Borough of Pottstown. This installation on East High Street converted two westbound travel lanes and on-street parallel parking into one westbound lane, one bike lane and back-in angled parking within the same available space. Installed in 2003, this concept "has helped revitalize the downtown by slowing traffic, providing more parking spaces adjacent to stores, encouraging bicycling, and making it easier for pedestrians to cross the street." The size and shape of the lot where the structure will be developed. Who the primary users of the facility will be. Connections to the adjacent street network. The architectural style of the structure's facades and how they may relate to existing adjacent structures. A municipality may also look for shared use opportunities – EPTA's West Chester Transportation Center was incorporated into the newly constructed parking garage developed by Chester County across from the Justice Center on Market Street.